We are located to the west of Atlanta, near the Fulton County - Brown Field airport. From I-20 west, exit off the Fulton Industrial exit and turn left. Turn at the first right at Shirley Drive. Go about ½ mile and turn right onto Shirley Way. We are located in the back left-hand building. The Address is 300-B Shirley Way. From I-20 East, take the Fulton Industrial Exit and turn right, then take the next right onto Shirley Drive. Go about ½ mile and turn right onto Shirley Way. We are located in the back left-hand building. The Address is 300-B Shirley Way. 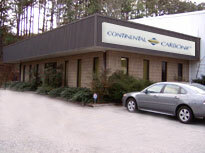 The Atlanta location serves central Georgia including the cities of Macon, Athens, Gainesville, Conyers, Kenworth, and Smyrna. Monday - Thursday: 7:00 a.m. - 4:00 p.m. and Friday: 7:00 a.m. - 3:30 p.m. or call after hours for 24-hour service. Continental Carbonic Products, Inc. in Atlanta, GA is one of 46 locations in the U.S. and Canada where you can buy dry ice in both cut block and pellet form. Continental Carbonic offers the highest quality, food grade dry ice in the industry.